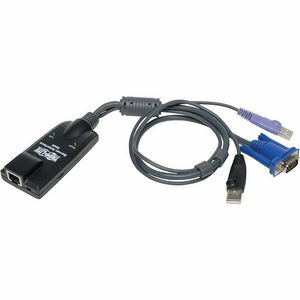 Tripp Lite's USB Server Interface Unit with Virtual Media and Common Access Card ( CAC ) support connects a USB server to a B064- IPG Series NetDirector KVM switch using Cat5e/6 cabling. The server connected using this interface unit will be able to access the Virtual Media functionality of the B064- IPG series KVM switch. Use of Cat5e/6 cables frees up space in server cabinets that would otherwise be filled by traditional, bulkier KVM cable kits. Compliant with the Federal Trade Agreements Act (TAA) for GSA Schedule purchases.